Life in a small town takes a dark turn when mysterious footage begins appearing on VHS cassettes at the local Video Hut. So begins Universal Harvester, the haunting and masterfully unsettling new novel from John Darnielle, author of the New York Times Bestseller and National Book Award Nominee Wolf in White Van. In Universal Harvester, the once-placid Iowa fields and farmhouses become sinister, imbued with loss and instability and foreboding. As Jeremy and those around him are absorbed into tapes, they become part of another story—one that unfolds years into the past and years into the future, part of an impossible search for something someone once lost that they would do anything to regain. John Darnielle’s first novel, Wolf in White Van, was a New York Times bestseller, National Book Award nominee, and a finalist for the Los Angeles Times Book Prize for first fiction, and widely hailed as one of the best novels of the year. He is the writer, composer, guitarist, and vocalist for the band the Mountain Goats. He lives in Durham, North Carolina, with his wife and sons. "Brilliant…Darnielle is a master at building suspense, and his writing is propulsive and urgent; it's nearly impossible to stop reading. . . [Universal Harvester is] beyond worthwhile; it's a major work by an author who is quickly becoming one of the brightest stars in American fiction." "This chilling literary thriller follows a video store clerk as he deciphers a macabre mystery through clues scattered among the tapes his customers rent. A page-tuning homage to In Cold Blood and The Ring." 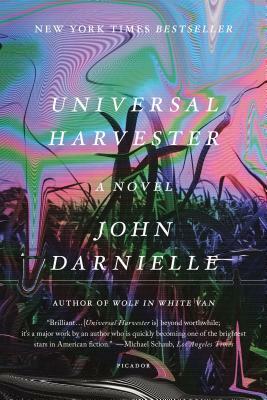 "Few books in recent memory have mastered the Midwestern uncanny as well as John Darnielle’s strange and lyrical Universal Harvester...Like Midwestern cornfields, this book haunts in many ways." "Truly excellent...In an age of puffed up literary doorstops, it feels vaguely miraculous that Darnielle manages to pack this haunting novel...into less than 300 pages."